Fans of the beautiful game can now bet on their favourite European teams with Virtual Champions League, a fast-paced take on one of the most prestigious football tournaments in the world. Developed by 1x2 Gaming, Virtual Champions League is a kind of very stripped down version of Championship Manager - except the latter allows you to win money. You can win up to 50x their stake on a single punt by betting on popular options such as first goal scorer and the final score. 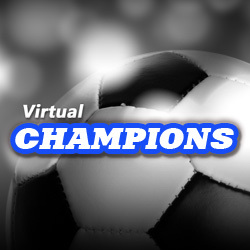 With a decent RTP of 94.8%, Virtual Champions League could net you some big cash prizes. 1x2 Gaming are a highly respected online gaming developer based in the so-called Silicon Beach area of Brighton. Established in 2002, 1x2 Gaming have steadily built up a portfolio of more than 30 games, including video slots, virtual sports, keno and instant win scratch cards. It’s clear to see that 1x2 Gaming are an ambitious bunch with a taste for sporting competition as their roster of virtual sports titles includes several games such as Euro Legends, Touchdown and Virtual Rugby to keep fans happy even when their team isn’t performing in real-life. 1x2 Gaming have given Virtual Champions League a parred down feel that puts the emphasis on the results themselves. Before delving into the betting options, let’s recap the format of the Champions League. The competition starts with 32 teams divided into eight groups. After each team has played the others in the group at home and away, the top two teams from each group will advance to the knockout stages where the European Champion will be crowned. Keep your eyes on the clock though as you only have a minute and a half in which to place your bets before the next round begins. As with an old Championship Manager game, you get to watch basic video highlights of the match to see whether you’ve backed a winner or a lame duck. If you wait until the end the competition you will also have the option of betting on group winners and the eventual competition winner. Virtual Champions League from 1x2 Gaming is a fast-paced virtual sports title from these creative Brighton-based developers. Although the strong football theme is likely to appeal most to fans of the game, the RTP of 94.8% and potential winnings of 50x your stake are likely to appeal to everyone. Virtual Champions League also allows players to stake between £0.01 and £200 per bet allowing players of every calibre to get involved.